This chart describes how urban populations vary considerably in their composition, not only of slum and non-slum residents, but also between size classes of cities and the proportions of those who live in slums and outside them. 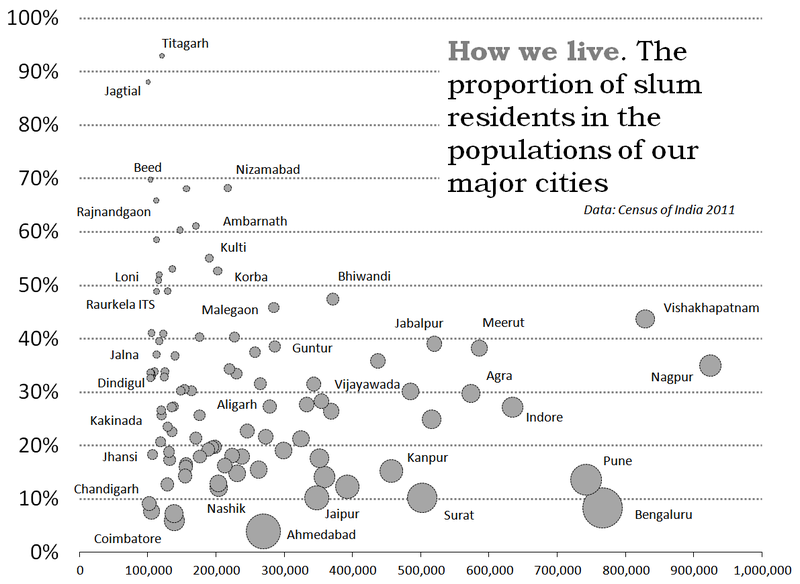 Plotted here are 98 of the top 103 cities in India whose slum populations are above 100,000 (2014 estimate). The five that are left out are Mumbai, New Delhi, Kolkata, Chennai and Hyderabad. This has been done to keep the chart legible, else the scale that these cities (especially Mumbai) and their populations would obscure the details for smaller cities, particularly those with populations of 100,000 to 500,000 residents. The left scale is used to plot the percentage of a city’s total population which lives in slums – keeping in mind that that Census 2011 enumerated 13.7 million households in slums. We can see a group of cities whose slum populations are above 50% – Loni (Uttar Pradesh), Korba (Chhattisgarh), Kulti (West Bengal), Ambernath (Maharashtra), Rajnandgaon (Chhattisgarh) and Nizamabad (Andhra Pradesh) amongst them. The bottom scale is used to plot cities by the size of their slum population. Jhansi (Uttar Pradesh), Chandigarh, Coimbatore (Tamil Nadu) and Nashik (Maharashtra) are amongst a group of cities all of which have slum populations of under 200,000 (and above 100,000) but these form less than 20% of their total populations. The size of a city’s circle in the chart indicates its total population. Bengaluru, Ahmedabad, Surat, Kanpur and Pune are the largest circles to be seen, none of which has slum populations that are more than 16% of their total populations. A chart such as this is helpful insofar as urban comparisons may be made between cities of similar size but different slum population proportions. But it must be read with a variety of related material and data. While this chart can quickly tell us that cities whose slum population proportion is above 20% – such as Kakinada (Andhra Pradesh), Aligarh (Uttar Pradesh) and Indore (Madhya Pradesh), all of which have different-sized slum populations and total populations – this does not mean that those residents are worse off, in terms of household income and access to basic services, than similarly-housed residents in cities like Bhiwandi (Maharashtra), Raurkela industrial township (Odisha) or Jabalpur (Madhya Pradesh). Cities in which municipal councils practice policy and legislative inclusion of slum residents can and do foster the success of micro-enterprises by encouraging the provision of spaces in which these residents can work and live without fear of falling afoul of regulations. A city with a slum population proportion of under 20% may – by forcing the location of work-home spaces in the margins, with poor ventilation, lighting and sanitary conditions – treat such a resident more unfairly than a city with 40% or more of its residents living in slums but whose needs and contribution to the city economy are recognised. That is why a slum household in Ambarnath may not be worse off than one in Kanpur, and a household in Vishakhapatnam may not be worse off than one in Jhansi.